Hudson Fasching carefully emptied the chocolate-colored formula into a feeding bag and fed the syringe end into a tube going into his little brother's stomach. "Cooper," he cooed, squeezing his unresponsive sibling's frail shoulder before curling up next to him in bed – a tall, broad-chested athlete beside a small, crooked boy. It's hard to imagine the 6-3, 200-pound Fasching could have had a much different life – one perhaps identical to Cooper, 13, and his sister, Mallory, 11 – who both have a rare cell disorder that has left them unable to walk, talk or feed themselves. "I got really lucky," he said. "Sometimes I kind of feel a little bit guilty, like I took all the good genes, and left them with all the bad ones." 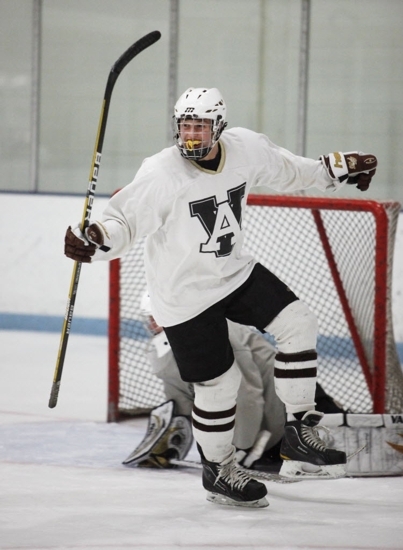 In fact, Fasching is not only healthy and able-bodied, but has grown into a multi-sport phenom who has gained the attention of college hockey scouts and national programs as a sophomore at Apple Valley. 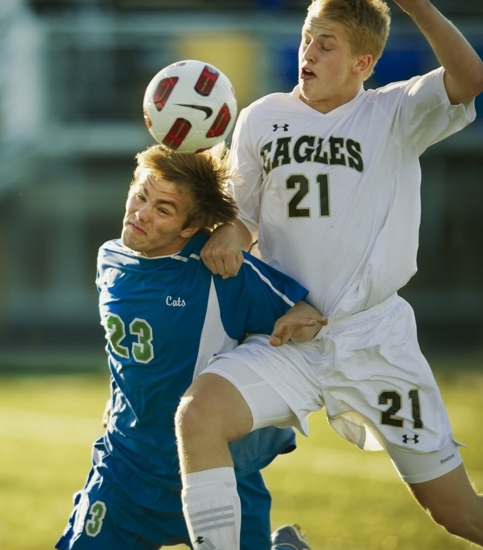 Having won two Class 2A soccer championships and impressed in a freshman hockey season that brought his team to the state semifinals, he is living a dream life for most 15-year-olds. But while many young stars would jump at the chance to follow the gleaming steppingstones as far as they would lead, Fasching's rare closeness with his family and unique responsibilities he shares in caring for his siblings shed a different perspective on his choices. It all started, Rick Fasching said, in his son's freshman hockey season, when Apple Valley was playing Blaine in the Class 2A quarterfinals. "I was just watching the game and my BlackBerry started going crazy," said Rick, remembering how texts of congratulations and calls from agents and coaches came pouring in. "I don't even know how they got my number." Since then, it's practically been non-stop: A whirlwind of voices trying to influence Hudson and his family as he starts to sift through the expanding options. Among those choices is which college to attend, or whether to play junior hockey, or whether he will accept the U.S. National Team Development Program invitation sitting on the table – an answer he would need to give by early next summer. The NTDP is a prestigious hockey program based in Ann Arbor, Mich., meaning Fasching would have to move away from home and finish high school there. A few months ago, when the Faschings were in Rochester, N.Y., for the Select 15 camp – a tournament for the top 100 hockey prospects in the country – Rick and Hudson's mom, Shannon, said everywhere they walked, they became nearly surrounded by strangers introducing themselves and wanting to talk about Hudson's future. "It was completely overwhelming," Shannon said. "They wouldn't leave us alone for a minute." Rick – who shakes his head and admits he's "flying blind" – absorbs as much of the business side of Hudson's upcoming decision as he can, trying not to interject his own wishes. "He's made plenty of sacrifices for us," said Rick of Hudson, who always has been cheerful about helping with his younger siblings. "So now, we want him to do what he wants to do." Hudson lauds the NTDP for its great facilities and world-wide competition, and he knows playing there would look impressive on his hockey résumé. On the other end of the spectrum are his love of soccer and the tugs of those last couple of years of being just a kid: hanging out with his friends, going to prom and having a girlfriend. 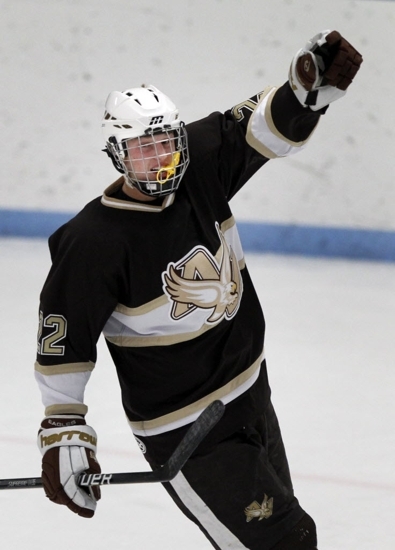 In addition, the Apple Valley hockey team is a program on the rise, particularly if Fasching stays. "I think he should stay here," said teammate and good friend A.J. Michaelson, a junior who said he thinks about the dynasty they could help create at Apple Valley. "We have great chemistry." But at the heart of the dilemma is the Fasching family's uncommon bond from years of relying on each other for love and support. "It would be really tough to pick up and leave," he said. "When I talk about [the NTDP], people say, 'Why wouldn't you go?' and 'That opportunity would be so much better.'" He paused and looked down at Cooper. "But they don't know the full story." Hudson and his dad have a secret handshake. It's a perfectly coordinated series of hand slaps and fist pounds, finished with two grinning, satisfied faces. "We had hours and hours at hospitals with nothing to do," said Rick, who at times appears more like a buddy to Hudson than a dad, weaving well-timed, snarky, back-and-forth quips with his son in between the loving, fatherly statements. "With Cooper and Mallory, Hudson and I have just spent an insane amount of time together." Hudson was 2 when Cooper was born, and six months later, his little brother developed what doctors now know is mitochondrial disorder. When the doctors determined the cause, they told the Faschings it was a "one-in-a-million thing," Rick said. It was only after he and Shannon had Mallory nearly two years later that they realized part of Rick's biology reacted with the gene Shannon carried, meaning it was much more likely to happen again than they thought. "With Cooper, it was OK, he'll be different," Rick said. "With Mallory, that was catastrophic." The Faschings' neurological pediatrician told the family Cooper and Mallory will not likely live past adolescence because of the years of strain on their respiratory systems. In searching for treatments for their unique children, the family traveled from their former home in Indiana to specialists in Chicago and Minneapolis, and Hudson spent most of his childhood in hospitals. If his dad had to work, the blond child would be stuck sprawling out with his 720-count box of crayons ("He always did hate coloring," Shannon said with a sigh), but if his father was around, the two would improvise other fun, such as elaborate handshakes. Through it all, Rick, Shannon and Hudson all agree they've become incredibly close. 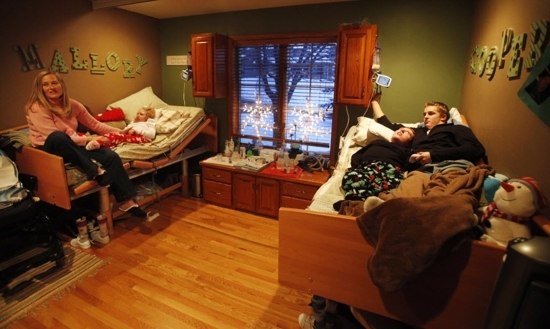 As the years went by, the family – which has the means to tackle the numerous financial headaches associated with long-term health problems – learned better how to care for Cooper and Mallory and moved into a handicap-accessible house. While the family has a nurse, Hudson still helps out a lot – feeding Cooper and Mallory, helping to bathe them or change their diapers, and give them their extensive medications. But when the chores are over, Hudson – Rick calls him a homebody – often will simply spend time with his younger siblings, curling up in their bedroom for a movie or bringing up Guitar Hero to play around them. When the kids were younger and smaller, Shannon and Rick would bring them to Hudson's hockey games, and Cooper's eyes would light up when he heard the rink music and the skate blades cutting through the ice, Shannon said. "They're my brother and my sister," said Fasching, who maintains a 3.8 GPA in all-honors classes, despite his crazy schedule. "I try to spend as much time with them as I can." Still, it's hard not to think about how things could be different for Fasching and his siblings, who, at 2 and 4 years younger. Sometimes he'll be downstairs playing video games, doing other "kid" things, Shannon says, "and he'll just say 'I wish my brother and sister could come down and play with me.'" Hudson says he cherishes the time he does have with them and the rest of his family. For an A-list hockey prospect on the fast track, those minutes could be fleeting. But he has the better part of his sophomore year ahead of him – including his second hockey season on a talent-packed, No. 6-ranked team – and countless memories awaiting. 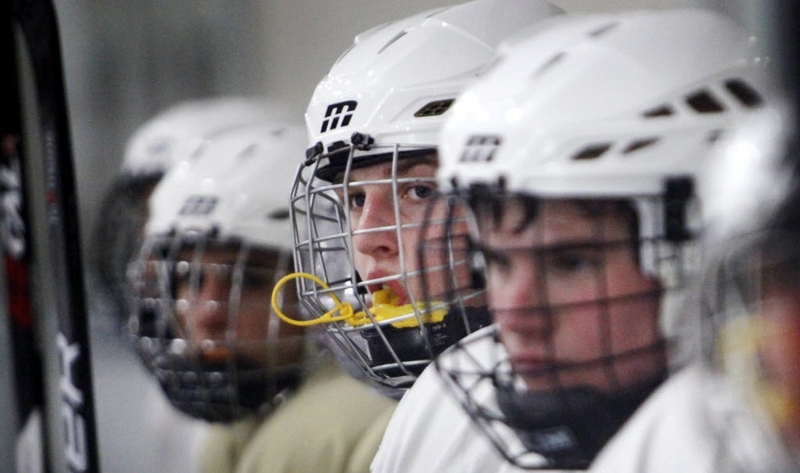 "He's as intelligent a player as you'll ever see," said Apple Valley hockey coach Jerry Hayes of Fasching, who led the team with 36 points in the regular season last year. "It's a rink rat's mind in a skilled player. Attach that to the physical attributes and it's really something amazing." And for now Fasching, who has three goals and eight points through five games, is simply trying to enjoy his high school experiences. "I'm just trying to live in the moment a little bit," said Fasching, still a kid despite the physical, emotional and career challenges behind and ahead of him. "I just want to absorb everything I'm going through right now, and hopefully that will help me make all my decisions." Jack Powell had a hat trick as the Cardinals advanced to their first title game, handing the Hawks their first loss to a 1A team in three years. With 32 goals and 36 assists this season, the senior forward helped the Hornets return to the state tournament after a two-year absence. The Moose claimed a 4-1 victory to win the Class 1A, Section 5 championship. The Dragons advance to the state tournament after winning the Class 1A, Section 3 title.